We have 5 cats. That might seem like a lot, and it is, especially when they all rely on the litter box. They almost all go outside, but there is something intriguing about the box, they just love to use it. 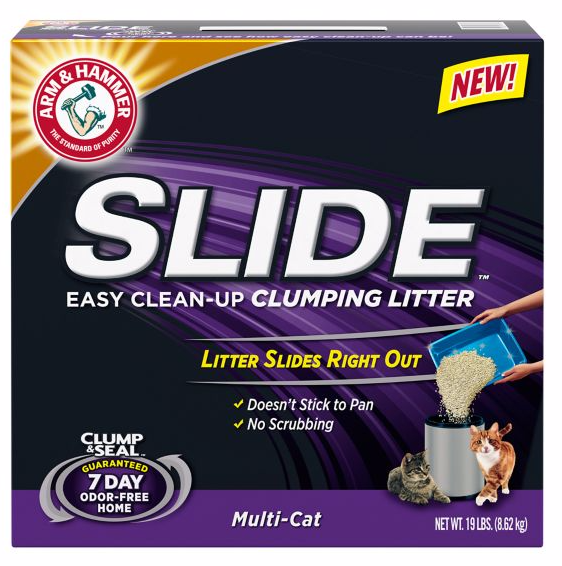 I have tried many cat litter brands over the years, and my biggest complaint is that when I go to replace the litter I have to soak the pan in water and dump it for all the cat litter to go out. Now with Slide by Arm & Hammer, I don't have to! The litter seriously just SLIDES right out of the litter box. Now, the litter you trust to eliminate odors also eliminates the stuck-on mess in the litter box! Our revolutionary formula slides right out, so there's no scraping or scrubbing. 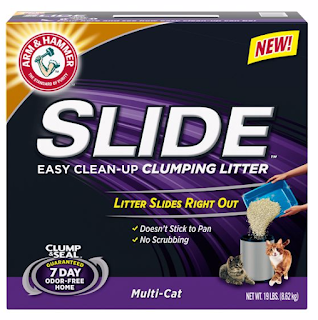 You can purchase Slide cat litter starting at about $10 at most grocery stores, and pet stores!